“I wasn’t born a man or a woman. I was born a baby. 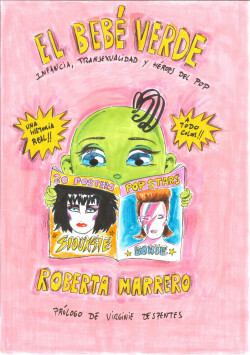 I need time to work out who I am.” So begins the illustrated autobiography of Roberta Marrero: the true story of a girl who was born with a boy’s body and her path to self-discovery and affirmation of her own identity. We are brought inside the inner universe of this ‘alien’ character, the green baby, in a world that constantly denies the image she has of herself; her soul, personality and truest self. How can she survive in such a hostile environment? By never forgetting that “you must always be yourself, whatever the cost. That’s the highest expression of normality.” A real story spiced with the visual and graphic universe of a groundbreakingly original artist who has established an explosive place for herself on the Spanish scene.